Saint Denis Northern Suburb of Paris, the same district of Stade de FRance, is inhabited by mainly Muslim immigrants from Northern Africa, the Maghreb, witnessed violent anti-police riots in the past, was and is a breading ground and a recruiting center for Jihad, was the base of the Buttes-Chaumont network after during the American invasions to Iraq after 2003 and is considered as a special policing area with special instruction for the police in that specific suburb. Actually it is a sort of an Islamic Ghetto like Molenbeek in Brussels. 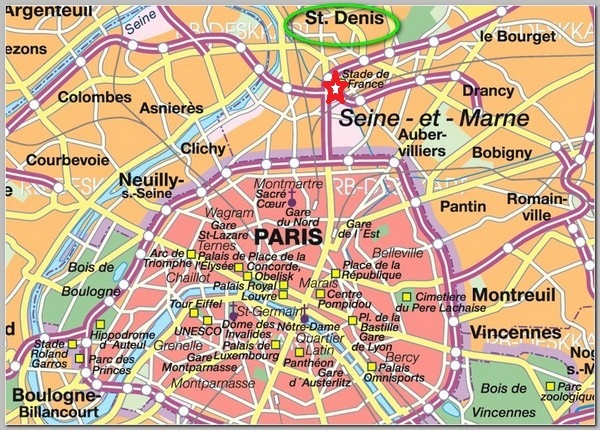 Five days after the Paris Terror Carnage of Friday 11/13/2015, French police and army raided, on Wednesday 11/18/2015 at about 04:20, a flat in Saint Denis following intelligence that a group of 7 Jihadist are preparing a second round of attacks in Paris and that the group is led by the mastermind of the previous attack Abdelhamid Abaaoud who, allegedly, left Syria and managed to sneak into France and more specifically into Paris in order to lead the second round of attacks. Hasna Aitboulahcen grew up in the Paris region and ran her own business, Beko Construction, until 2012. She was on the radar of intelligence services, the Guardian reported. Here cellphone number was found in a new cell phone, used by one of the attackers for instant messaging the last hours before the attack and dumped in a dustbin near one of the attacked locations. Since Hasna Aitboulahcen was already known to the French Security services she was put under close surveillance that. eventually, led to the raid on their hiding place. Seven arrests were made. Three men were arrested in the apartment. Two others were found hiding in rubble and a further two – including the man who provided the lodging – were also detained But the fate of chief suspect Abdelhamid Abaaoud was not yet clear although the French authorities believe he was the one male killed in the raid . A third body, also of a women, has been recovered from the apartment in the Paris suburb of Saint-Denis raided by police, prosecutors said on Friday 11/20/2015. They also confirmed that one of the dead was Hasna Aitboulahcen, 26, but some reporters raised doubt whether she was the suicide bomber or the unidentified yet third man killed in the raid.